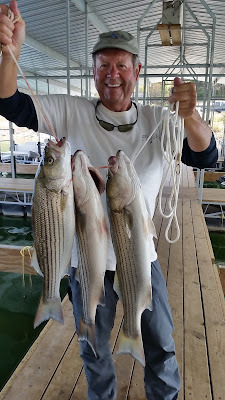 I have been fishing for striped bass and doing OK until the last couple of days. I am finding good fish in the mornings and late afternoons, but they are not real aggressive in biting. 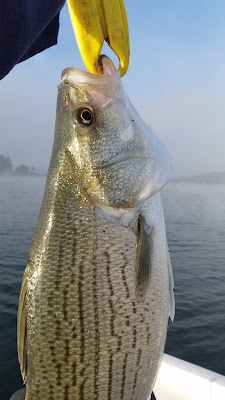 I have been fishing on some of the flats heading up river, but today I decided to check out other areas where stripers are typically biting at this time. I found a lot of big fish suspended at 40 - 55 feet in 120 feet of water off of deep water bluffs. I dropped live bait as well as jigged a spoon, but had no takers. I feel these fish are hovering in the deepest, coolest water they can get to, that still has good oxygen. From the last oxygen report that I have seen, at depths below 55 feet the oxygen level is very low saying the lake has not totally turned over at this time. 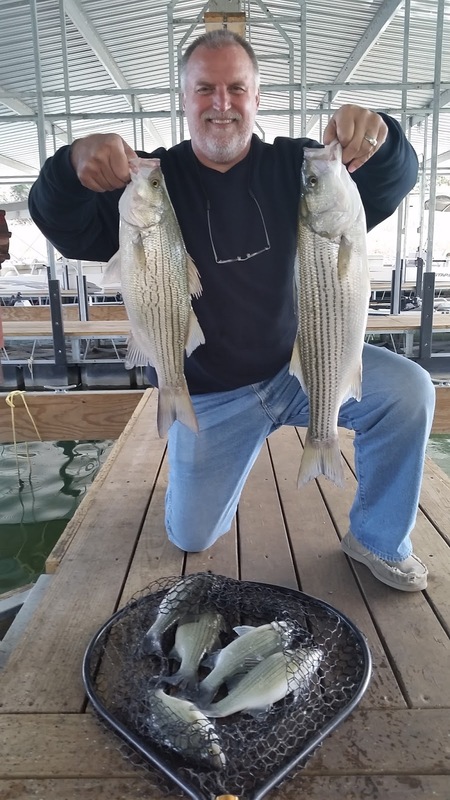 The good news for fishing is that assuming the current long term weather forecast is correct the weather will cool starting this Thursday or Friday and stay at normal temps. The lower ambient temperatures will lower the lake water temperature and allow the lake to finish it turnover and the fish will truly start their fall feed. It won't be long. Even though the striper bite has slowed for me the largemouth bite has been excellent. Today I found surface feeding fish around the bridge columns and had a blast. Any top water bait would have worked, but I had a Kastmaster tied on so I starting casting. Every cast for 45 minutes I either caught a good sized fish or had a bump and missed it. Crank baits are working for the suspended fish and plastics worked along the bottom are also working well. Deep water bluffs either in a cut or at a point are great areas to catch some nice fish. 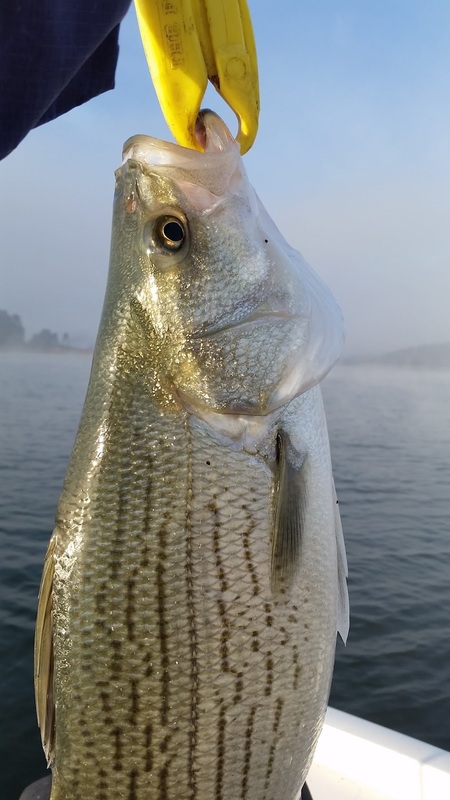 I have also picked up some nice bass near brush piles jigging a spoon in 35 feet of water. 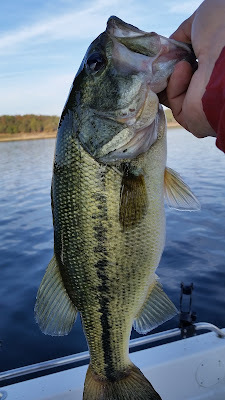 The crappie bite is also pretty good. 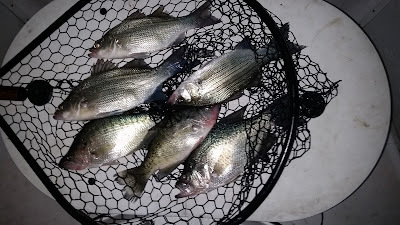 I have caught some nice slabs on a 35 - 38 feet deep main lake brush pile. The fish were suspended 20 - 25 feet down on the top of the brush pile. Sunrise and sunset are two great times to catch crappie, but you can also pick up some fish during the day. 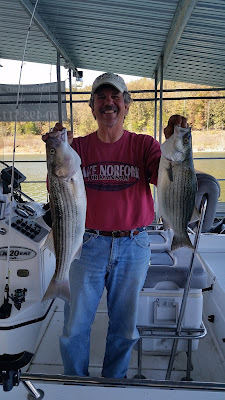 Catfish are biting well for a couple of my guests using jugs set in 30 - 40 feet of water. Their best bait so far has been night crawlers. The surface water temperature is in the 72 - 74 degree range which is slightly higher than my last report. A rise in lake temp is not normal for this time of year. The lake level is fairly stable and currently sits at 552.55. The creeks and coves as well as the flats on the main lake are stained. The deep water of the main lake appears to be clear on the surface.